BUTCHER Barnie Nolan's taco-tasting chorizo sausage remains undefeated after the butcher claimed his second National Sausage King title. Mr Nolan, the owner of Circle T Meats at Raceview, has also won six state titles. Mr Nolan has been a butcher for 26 years and is taking steps to cater for his more adventurous customers by adding pumpkin, feta and shallot sausages and pork, apple and sultana sausages to the menu. "I just get a craving for something. Sometimes it works and sometimes it doesn't," Mr Nolan said. "You are only limited by your imagination." He recently tried a coffee and almond-flavoured sausage but it did not work out as planned. Mr Nolan admitted his ideas do not always work but said "you have to experiment otherwise you will be driving around on square wheels". 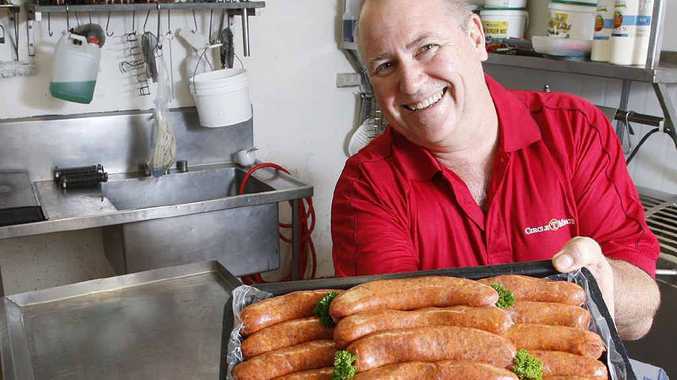 Sausages account for 25-30% of the business's yearly turnover, with the best sellers being plain beef and pork. The butcher said that a win tended to have a positive effect on sales. "It's a bit of a game, but it's good for business," he said.